The world’s largest cruise line industry group is backing a campaign to help protect donkeys and mules from overweight tourists and heavy loads. The plight of Santorini’s donkeys often hits the news in the summer season with sensational headlines about donkeys and mules being forced to carry unreasonable loads in the heat of the day and without adequate welfare provision. Holiday hotspots will be targeted by the campaign that has the backing of the Cruise Lines International Association (CLIA), following a public outcry about overweight tourists using donkey taxis. 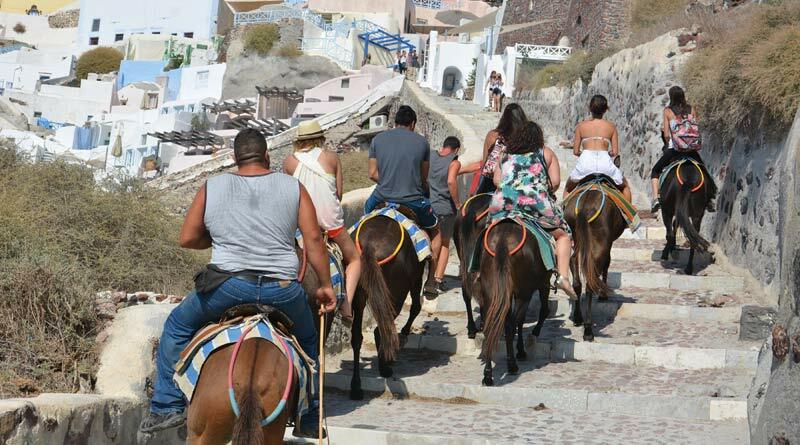 The campaign launching this week In Their Hooves is being led by international animal welfare charity The Donkey Sanctuary, and asks holiday makers to stop and think before taking donkey or mule rides in Santorini and other holiday destinations. The charity has created a video animation to help tourists assess the working equines they encounter. Barbara Massa, The Donkey Sanctuary’s regional director for Europe, said the Santorini municipality had helped deliver training to local enforcement bodies as well as supporting a revision of the existing Code of Practice for working equines in Santorini. “We are excited to launch the In Their Hooves video and we hope visitors to Santorini are able to make informed decisions about the welfare of working equines they will see there. We will continue to work with the municipality, providing training to equine health service providers and also the animal owners, all of whom are critical to improving the working conditions and practices on the island,” Massa said. CLIA is the cruise liner industry’s largest trading association and more than two-thirds of all European cruise companies docking at Santorini are members. Cruise passengers will be able to see the In Their Hooves video on board liners heading to Europe and supporting information leaflets will be readily available on board liners docking in Santorini. The Donkey Sanctuary has been working in partnership with Greek Animal Welfare Fund (GAWF) and visiting Santorini to deliver joint equine outreach since 2000. More recently the charity has redoubled efforts to work with Greek authorities to establish better working practices. During a welfare assessment trip in August 2018, Santorini’s mayor Anastasios-Nikolaos Zorzos made welfare commitments, including improved access to water and shade, particularly in the main tourist area of Fira. The Donkey Sanctuary followed up on its own commitment to provide welfare training to police and municipality staff working in Santorini. The charity is due to return shortly to follow up on Zorzos’ promises as well as provide more training, this time for vets and donkey taxi owners. The charity hopes that as more people watch the video, they will ensure that they remember the #intheirhooves messaging any time they pay for a donkey or mule service. Im so happy somebody with some clout is speaking up for these poor donkeys. God bless this cruise line and their endeavours to help! Thankyou. I will highly recommend your ship line. As an overweight person, I wouldn’t use the mules or donkeys ..i’d walk. As a equine lover I would also look at the care of the animals and voice my concern over needing shade, water or medical needs. I’m glad the cruise lines are addressing this, because you have to hit people in their pocket before they make changes. It is great to hear somebody is looking into this matter. It is a good thing the Cruise Lines are supporting this campaign. I work for them and got these sad comments from guests several times. I am very glad this is happening and hope these requirements will become strict regulations.